What it is all about.. When it comes to town pride, there are few places that can match it with Loxton. Locals are passionate about their town, and love to watch it adapt and transform. It is this progressive attitude which has seen the recently transformed Loxton Courthouse Apartments become the newest part of the town’s landscape. The Loxton Courthouse was officially opened to pomp and ceremony over 50 years ago, in December, 1963. While there was (and still is) little crime to report, the courthouse housed many characters in its history. A former police officer tells of leaving an empty cell unlocked for a particular local on a Friday night, so that he might retire for the evening and avoid driving home after a lengthy session at the pub. Years later, Loxton’s police station relocated, leaving an empty building in a prime location. Loxton Courthouse Apartments was the passion project of three local families, and one Adelaide couple, who have holidayed in Loxton for the past 40 years. Inspired by the idea of creating modern, luxury accommodation for those who might want to discover their beloved town, these families collaborated to purchase the building and perform the ultimate makeover. Whether it’s the friendly locals, village style main street shopping, attractive gardens and views of the breathtaking Murray River, there is plenty for locals and visitors alike to love about Loxton. 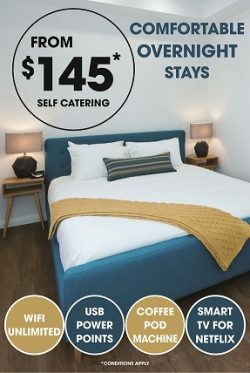 Join us at the stunning Loxton Courthouse Apartments and find out for yourself.